ISLAMABAD, June 15 (APP): Prime Minister’s Adviser on Foreign Affairs on Wednesday expressed serious concern over the continued unprovoked firing by the Afghan forces to disrupt border management efforts by the Army inside Pakistan’s territory. 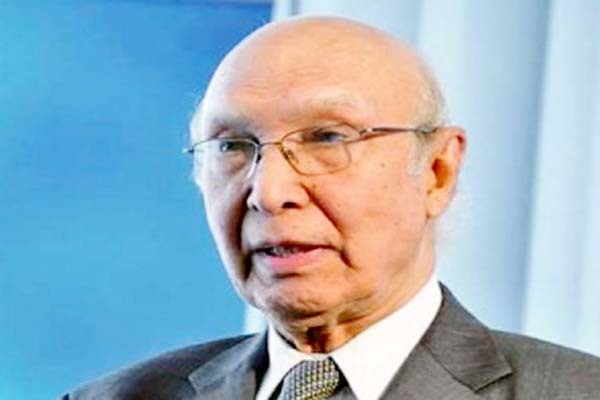 Sartaj Aziz said durable peace and stability across the border could not be achieved without taking effective measures for strengthening border controls. He said strengthening of border management was an important part of counter-terrorism effort and also for checking issues of drug trafficking and other illegal activities. He said dialogue between Pakistan and Afghanistan was important and the ongoing tension was against the spirit of friendship between both countries, which is based on common religion, cultural values and strong bonds between the peoples. He hoped cooperation from Afghanistan in addressing the security issues, especially cross-border terrorism, due to the unregulated porous border between Pakistan and Afghanistan. The Adviser expressed condolence over martyrdom of Major Ali Jawad Khan Changezi as result of unprovoked firing by Afghan security forces at Torkham border.